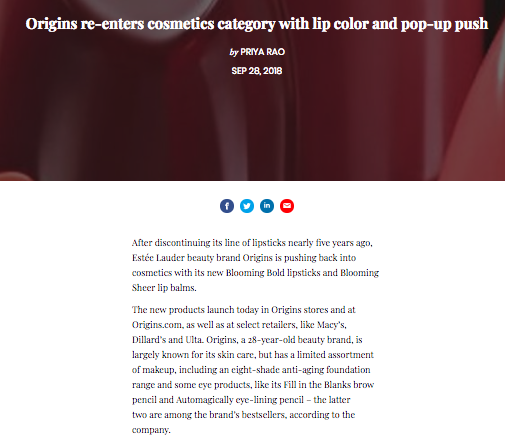 "Origins has been a fairly bright spot for Estée Lauder Companies, which reported a net sales increase of 16 percent for the company for the 2018 fiscal year. It called out the beauty brand as a key driver in the business’s skin-care net sales, along with Estée Lauder, La Mer and Clinique. Additionally, Origins ranked seventh in Tribe Dynamics’ earned media value report for March with $2.7 million in EMV, which is a 181 percent year-over-year increase. Origins EMV was also high in April with $2.3 million around the brand’s #GreenThePlanet social campaign."